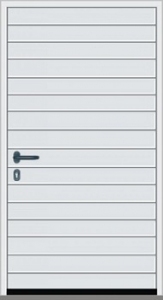 Hormann side doors are available to match Hormann sectional garage doors and Hormann up & over garage doors. The doors below show the three rib designs (S-Rib, M-Rib and L-Rib) and the S-Panel Georgian design which are a perfect match to the sectional doors. 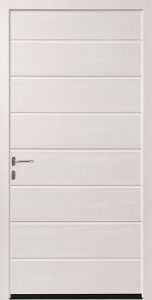 42mm thick, twin-walled and foam-filled, these doors come pre-framed for quick and easy on-site installation. Corner frame or block profile frame available. The block profile frame is the popular one, as it facilitates between-brick or back of brick installation. Block profile frame versions come with 3-way adjustable hinges. 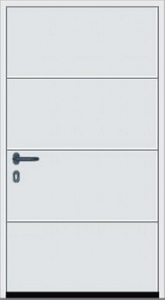 Available right-hand hinged or left-hand hinged, opening in or opening out. Secure mortice lock and black plastic door furniture supplied, as standard. Upgrades available e.g. brushed stainless steel. All round seals. 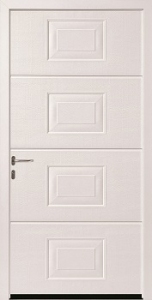 Available in White, Woodgrain laminates and colours. Door frames come in matching colour to the door leaf. Standard sizes and made-to-measure available. 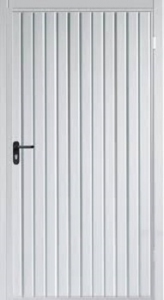 Side doors to match the up & over range of Hormann doors are non-insulated, single-skin steel and come on corner profile frames, as standard. Standard sizes and made-to-measure. 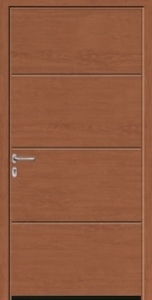 Please also see Hormann Rollmatic matching side door. All doors made-to-measure and come pre-installed on a matching frame. Available in all the standard colours and Woodgrain colours of the Rollmatic roller garage doors. Please phone or e-mail with your aperture sizes and exact requirements.